Spiders Web Hotpad -- A free Crochet pattern from Julie A Bolduc. This hot pad could also be a potholder by just leaving out the CD. 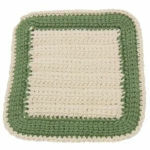 I would recommend using cotton yarn instead of acrylic though for a potholder.